Our government has been and, it seems, will remain divided into two nearly equal factions, each of which will do almost anything to prevent the other from achieving any success. After all, the party that can be shown to have failed is likely to get fewer votes. It strikes me that a little unity and cooperation would solve a lot of the problems that all these people (elected officials) must perpetuate if they are to further their careers. Did Obama say he wanted to bring back all those good factory jobs that went to China? Wow, now that's what I aspire to: sitting on an assembly line putting together cell phones for minimum wage. nwas BEAUTIFUL when it came to the economy. Obama TANKED on the economy. Obama was allowed to talk almost 4 minutes more than Romney. 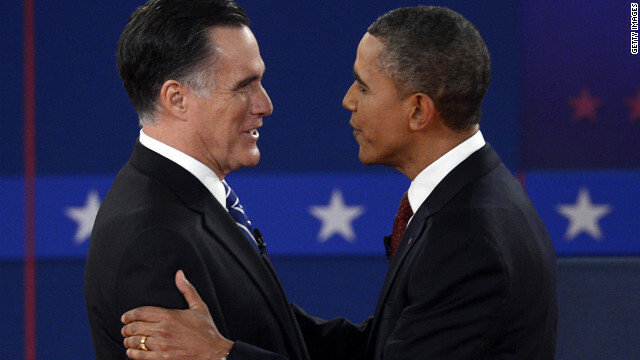 Candy stopped Romney, Obama kept interrupting Romney.. like Biden did last week. Rude and incompetent. I feel the president did a good job . I voted for him and I will vote for him again . God bless the president and his family.